An herb that helps detoxify your blood, lymphatic system, and skin? Meet the burdock root. Burdock (Arctium lappa in Latin) is a vegetable that native to northern Asia and Europe. The entire plant is edible but its roots are considered to be its most important part. While burdock root isn’t as buzzworthy as other medicinal roots like ginger or ginseng, it has actually been used for centuries in traditional medicine, mainly as a diuretic and digestive aid. It was also used as an ingredient in hair tonics and cosmetics for aging skin. Research has shown that burdock root has many powerful antioxidants, including quercetin, luteolin, and phenolic acids. These antioxidants protect the cells in the body from damaging free radicals. It helps treat skin issues. The root has anti-inflammatory and antibacterial properties that can help resolve skin issues like acne, psoriasis, and eczema when it is applied topically. A study has even found evidence that shows burdock root may help treat topical burns. It gets rid of toxins in the blood. One of the traditional uses for burdock root has been to cleanse the blood. Recent studies have found that burdock root can remove toxins from the bloodstream and helped improve circulation. The diuretic action in burdock root helps reduce water retention. It may also help clear away uric acid and potentially harmful wastes. It helps restore the liver and gallbladder and also helps them function properly. 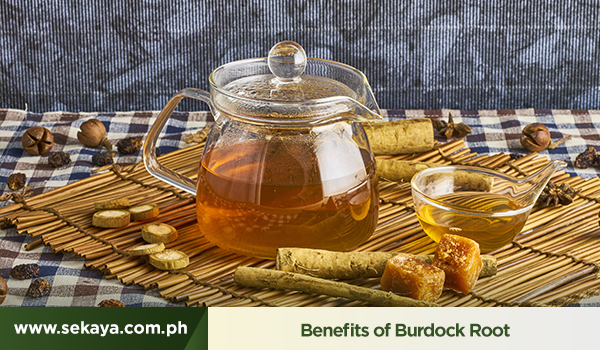 By promoting a healthy liver, burdock is helpful in treating stagnant blood conditions and revitalizing the body. The kidneys also benefit from its cleansing properties, as it also helps clear toxins from the urinary system. This can help treat urinary infections and kidney disorders. Burdock root is one of the botanicals in Sekaya’s Gentle Detox. This blend of Burdock Root, Dandelion Root, Peppermint Leaf, Red Clover Leaf, Licorice Root, Yellow Dock Root, and Ginger Root strengthens the body’s daily detoxification process.